Pictured right to left are Savannah, Keri, & Clayton. These 10 year old rescued greyhound siblings do everything together, including getting into trouble. They actively live by the motto, “All for One & One for All”, or should it be “All for One & One for a Biscuit!”? 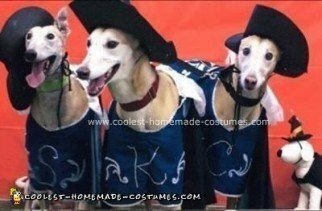 They will certainly do anything for a treat – including spending time wearing silly hats and capes. So we dressed them in this Homemade Three Muttsketeers Dog Costume. The front of each costume shows the pup’s first initial in rhinestones as well as matching vine and leaf designs in iridescent glitter. The back of each costume depicts an original greyhound heraldic crest which features a white greyhound centered on a black shield which is surrounded by an iridescent white glitter filigree design that is outlined in silver cord. The costumes include white, lace trimmed collars. Each pup sports a black cape lined in pale blue satin and decorated with black glitter fleur di lis. The costume hats are black faux felt trimmed with a row of mock pearls and a white feather. A testament to the comfortable nature of these costumes, while wearing them, each pup took the opportunity to stretch out and enjoy a lovely nap. so cute and funny…and original! great job!